The solar array will supply 75 percent of the power needed to operate it. Greenskies will sell the power produced to Middletown at a discounted rate for the length of the contract. John Beauton is vice president of construction at Greenskies Renewable Energy of Middletown. 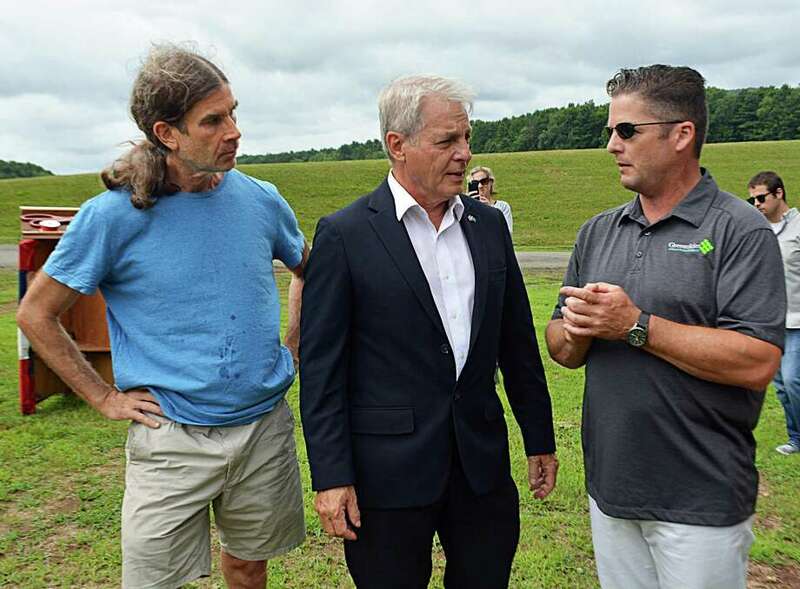 MIDDLETOWN — Calling it a victory for the local environment and economy, officials Thursday praised the installation of a 714-panel solar array to help mitigate the effects of the “single largest energy hog in the city” — its water treatment plant. These solar panels, installed in June by Greenskies Renewable Energy, on Middletown property adjacent to the Higby Water Treatment Facility at 260 Meriden Road, Middlefield, is projected to save the city 280,000 kWh of electricity per year. “This is an important project, especially now with people conserving more and more water, and the demand for water is trending downward. Without this project, we would eventually need to raise rates,” said Joe Fazzino, acting director of Middletown Water & Sewer. “It will produce clean water using less electricity from the grid, which, in turn, helps stabilize water rates we charge customers,” Fazzino added. The arrays, installed at the facility on the Middletown line, are projected to power 85 percent of the facility’s electricity usage. State Sen. Len Suzio, R-Meriden, and others were particularly pleased the city enlisted a Middletown-based small business to complete the project. “We’re adding another source of clean energy to our local facilities. It’s a small bit in the overall plan, and overall impact to the environment, but that’s how you get big accomplishments done: one step at a time,” Suzio said. Greenskies, which paid for the system and installation, will sell the power produced to Middletown at a discounted rate over the 20-year contract. The firm also installed arrays on the roof of the city-owned R.M. Keating Historical Enterprise Park on Johnson Street, where its office is based, as well as Wesleyan University, two in upstate New York and another at the Meriden Markham Airport. In 2016, the average annual electricity consumption for a U.S. residential utility customer was 10,766 kilowatt hours, according to the U.S. Energy Information Administration. The water residents drink goes through an intensive treatment process at the Charles B. Bacon Water Filtration Facility, officials said. The project is expected to save the city $9,000 annually in electricity costs, significantly reducing the environmental effects of burning fossil fuels. Emission rates will now be one-tenth of previous output there. The project, 6 years in the making, launched late last fall and was completed in early spring, said John Beauton, vice president of construction at Greenskies. “This does a lot for Middletown. Being local, it’s very important to us to carry this message throughout the United States — even more so that we’re doing it here in Connecticut,” Beauton said. “I’m confident that this will produce power that this plant needs throughout the day so they can operate their pumps efficiently and have sustainable energy as part of that platform,” he added. “The building is going to pull power it needs from solar field first before it pulls from the grid,” Beauton said, as he led a tour of the fixed solar-powered system. The panels don’t rotate with the sun’s position, he said, like others do in the northern and southwestern portions of the country. “In the Northeast, the challenge with that is, with the winters we have, if the motors got frozen up or bound, the maintenance on a field like that is tremendous — so it definitely becomes beneficial to the user,” Beauton added. In Connecticut and other parts of the northeastern United States, peak solar power production months are July through September, when the sun’s elevation is lower and there is less sunlight, he added. In the winter, particularly January and February, output is low because snowfall is concentrated during those months, Beauton said. Jeff Hush, member of the city’s Clean Energy Task Force, represents low-income interests on the panel. Comfortable, Healthy, Energy Efficient and Renewable Middletown, dubbed CHEER, is a collaboration between the task force, North End Action Team, Home Energy Services, New England Conservation Services, Sunlight Solar and others which hopes to lessen the city’s dependence on fossil fuels. The task force is accelerating its attempts to improve housing costs for low- and middle-income communities in Middletown, who carry an energy burden disproportionate to their household earnings, he said. “Low-income people pay a much higher percentage of their income on rent and energy. They often have problems paying their energy bills,” Hush said. The task force is championing the building of more shared solar arrays over the next two to five years in Middletown, he said. Members are looking at possible places for panels, such as the former Connecticut Cleaners on Grand Street — now a brownfield site. “A brownfield is a property, the expansion, redevelopment or reuse of, which may be complicated by the presence or potential presence of a hazardous substance, pollutant or contaminant,” according to the federal Environmental Protection Agency. “We’d like to convert places like that, and the roof of the Green Street Arts Center, into solar arrays, and have shared solar for local, low-income people. That’s the big push for the future of Middletown. The past, and what was done today, is a wonderful step and it’s very encouraging,” Hush said. The task force has found working with Connecticut Green Bank and solar companies helps with financing such projects. “It puts the burden and the risk partially on the company, and not just on the individuals or the shared low-income community groups,” Hush said. “The hardest part of improving low-income housing is the element of getting renewable energy, but we’re really dedicated to making that happen,” he added.